Location: in my head but i have come to terms with my demons. 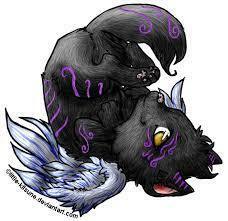 i am part (i don't kown)and i have a demon and a wolf soul and human. I am 17 year of age,male I know what some of past lives are My true name is griffin I am the only person in my family that know about magic and paranormal I am seeking to find out my past because i have not fully discovered my past Also I have seen a black angle once but I was young I also know I am not completely human One of my past lives is a demon Hunter named Jack wolf There was also a wolf with really dark fur which is called shadow. Mail me if one of those sound familiar. Also one of my friends called himself a son of a Greek God But he disappeared, I hate that kid, too much of a jerk To be honest I have no idea what happened to him, maybe my more crrupt side may have gotten rid of him, but I don't know. . . . . . . . . . . . . . . . . . . . . . . . . . . . . . . . . . . . . . I have gotten comfortable with my inner demons, i haven't tried witchcraft in about a few year but i am gonna try again. May the gods be with me. The more I learn of my past the foggier it becomes. my past lives hide within they bicker about control. They help me from time to time. The fallen one lives still, the hunter became what he sought to destroy. The beast became one with shadows. The trickster will have his final laugh at the end.